The essential elements of an Aussie Christmas lunch. Let us face the cold naked truth. For those of us that love Christmas, myself included, there is a lot of joy to be had in the planning and execution of the perfect Christmas lunch. I can barely remember the presents I received but, the Christmas lunches of my childhood are burnt into my brain. Cold chicken, my mother’s potato salad (which, in hindsight is a strange combination of potato, carrot, mayo, dried mint and sesame seeds) something with an Asian influence (oftentimes we had oriental chicken drumsticks cooked in the microwave, the soy sauce being the only thing that gave them a connection to Asia) and bowls of nuts and cookies and little treats. The year my mother discovered Vietnamese food was my favourite. We made our own rice paper rolls, sitting on the floor around the coffee table in the lounge room. My perfect Christmas lunch still harks back to those cold lunches of my childhood. It&apos;s not exactly a coherent menu, but I maintain it&apos;s a sophisticated if somewhat odd reflection of myself, our multicultural community in Australia and just plain bloody tasty. Because all good meals start with an aperitif, and a champagne cocktail is the most festive of them all. The perfect fresh entree for Christmas in the summer, and a throwback to my childhood. Dolmades, cold meats, olives, hummus and dukkah. Get in my belly. Literally, throw another prawn on the barbeque. Because there&apos;s nothing more Australian, and nothing more delicious. Barbequed butterfly turkey in a tequila marinade. In a nod to his native Canada, my father in law barbeques a butterfly turkey every year. He marinates and bastes it in a mexican inspired tequila based concoction. It&apos;s charred, and caramelised, and boozy and delicious. Highly recommended. Come on. Christmas without gravy is just not cricket. At least two fancy-as-f*** salads. I strongly recommend the Fattoush salad recipe in Jerusalem, by Yotam Ottolenghi. Also, anything with pomegranates in it says instant Christmas to me. Think your favourite green salad veggies with pomegranates and green grapes. A super fresh chilled white wine. I adore Lavender Hill Riesling from Jim Barry Wines in the Clare Valley. It&apos;s fresh and fruity. Step aside, New Zealand. This is a job for Australia. I find I have great success with Donna Hay&apos;s recipe. My colleague, Lauren&apos;s Christmas pavlova from last year. Image supplied. Christmas cake.... ice cream truffles. My lovely Nana grew up in the UK, and never quite adjusted to the fact that it&apos;s just bloody hot in Australia at Christmas. She still holds onto her Christmas pudding with brandy sauce tradition with a white knuckle death grip. Sure, Christmas is about joy and good will to all people, and Santa Claus, and the birth of Jesus, and being with family, and presents, and sharing. But, let&apos;s face it, if Christmas didn&apos;t also have a foodie element, a) a whole bunch of celebrity chefs would be out of work and b) it just wouldn&apos;t be anywhere near half as fun. 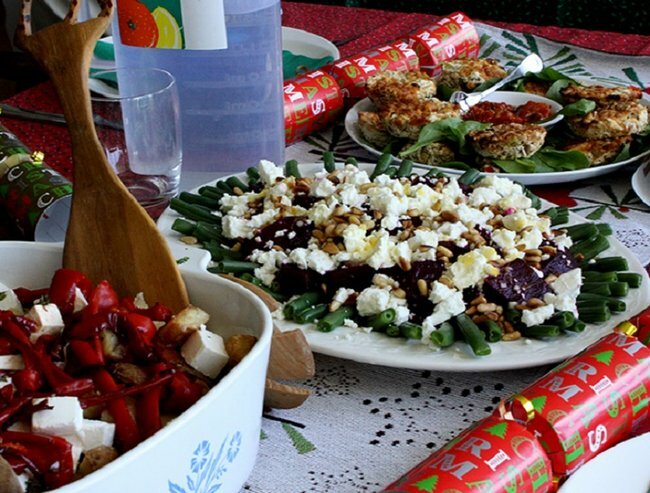 What food can you not live without on Christmas Day?